Hi, I’m a 5th grade student at Montessori and in this project I am going to talk about dressage. I ride horses in Fort Calhoun and I am learning to ride Western and English horses. I have rode now for about eighteen months and I love being around the big and intelligent animals. I hope that after you read my blog about dressage you will start to like these beautiful animals. 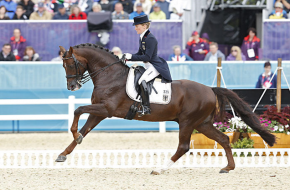 Dressage is a competition in which horses perform special movements in response to signals from their riders. Both horse and rider are expected to perform a series of movements, specific gaits (walk, trot and canter) and they are judged on how well they do it. 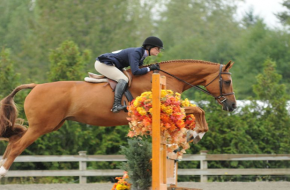 There are a few kinds of dressage like Hunt Seat dressage and Jumping dressage. Hunt Seat is like in the middle of saddle seat (American Saddlebreds) and western riding with American quarter horses. Hunt Seat dressage is where you and your horse perform jumping in two point jockey position (above) and stay in the position the whole time without tiring. Jumping dressage is where your horse has to know the order of the jumps so the rider has can focus the most on keeping heels down to stay in the saddle, to control the horse and learn to keep in contact so the rider doesn’t fall off. Some people consider dressage as horse ballet because the horse and the rider move so gracefully together like a ballerina. I really like horses, and would like to keep learning about them and keep giving my knowledge to the world.